The dense forest of the Osun Sacred Grove is located on the outskirts of Osogbo, the capital city of Osun State. 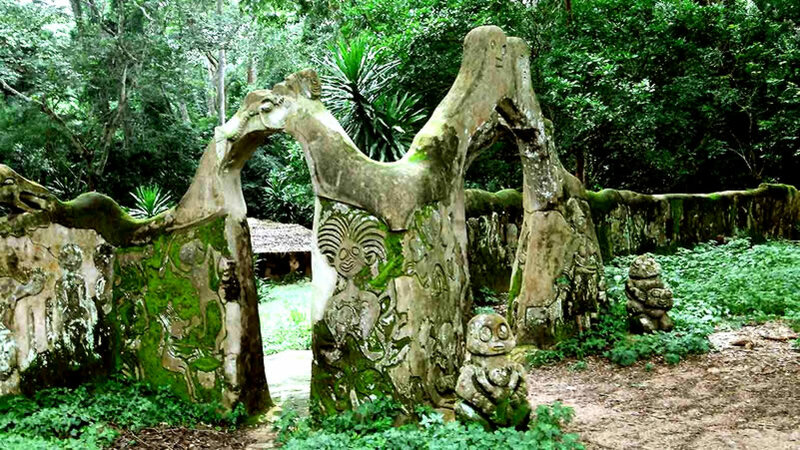 The grove which is one of the last remnants of primary high forest in southern Nigeria, is regarded as the abode of the goddess of fertility – Osun – one of the pantheon of Yoruba gods! 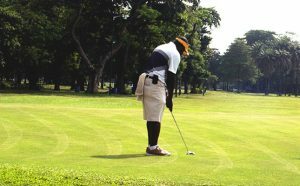 The landscape of the grove and its meandering river is dotted with sanctuaries and shrines, sculptures and artworks in honour of Osun and other deities. The sacred grove, which is now seen as a symbol of identity for all Yoruba people, is probably the last in Yoruba culture. It testifies to the once widespread practice of establishing sacred groves outside all settlements. 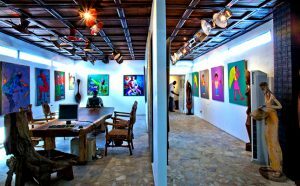 The development of the movement of New Sacred Artists and the absorption of Suzanne Wenger, an Austrian artist, into the Yoruba community have proved to be a fertile exchange of ideas that revived the sacred Osun Grove. 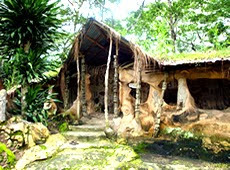 The grove is the largest and perhaps the only remaining example of a once widespread phenomenon that used to characterise every Yoruba settlement. It now represents Yoruba sacred groves and their reflection of Yoruba cosmology. Osun Grove is a tangible expression of Yoruba divinatory and cosmological systems; its annual festival is a living thriving and evolving response to Yoruba beliefs in the bond between people, their ruler and the Osun Goddess. Osun, also known as Yemoja, is one of Yoruba Orisas and the goddess of all the waters on earth. 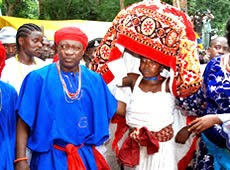 The orisa Oshun is commemorated annually in an elaborated festival held on the bank of the Osun River. 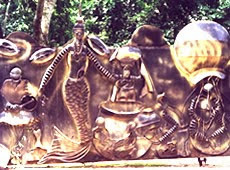 Osun is also celebrated in other parts of Africa and Brazil where the Orisa is referred to as Yemoja. 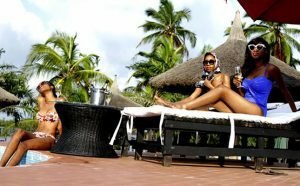 Check out Osun State hotels, restaurants and attractions. Osogbo city has one of the best museum of arts in Nigeria as a result of its position in the Yoruba cultural heritage. The city of Osogbo is culturally and historically enriched with many artifacts relatively important to the establishment of the city as well as the Yoruba race entirely. This is one of the top holiday destinations in Oshogbo is where metals are artistically crafted and shaped to make valuable items. 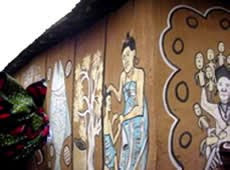 Osogbo residents are known to be very artistic and the city has produced very many internationally recognised artists; among them are Nike Arts, Twin Seven Seven, Jimoh Braimoh and others. Osun Cultural Festival is an annual event that takes place in Osogbo usually around August. The festival attracts Yoruba culture and belief enthusiasts and other visitors from all over the globe. The festival offers visitors the opportunity to visit the great Osun Grove, a sacred forest along the banks of the Osun river just outside the city of Osogbo. As part of Osun Sacred Grove tour, visitors will be able to visit the Ataoja of Osogbo Palace located in the heart of the city. The palace is an ideal place for tourists to learn more about the city of Osogbo. 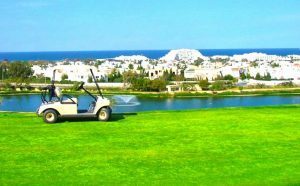 The palace has a museum where the historical facts about the establishment of the city are carefully preserved. 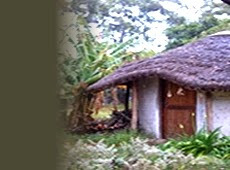 There some locally made hut chalets where visitors can relax or get refreshments after exploring the sacred grove and its thick forest as well as the Osun river.